Peagle – Is the Pekingese Beagle Mix Right for You? You are here: Home / Breeds / Mix / Peagle – Is the Pekingese Beagle Mix Right for You? Have you found yourself smitten with the Peagle? Join us as we go over everything you should know about this adorable crossbreed, the Pekingese Beagle mix! Just Who Is the Peagle? The Peagle, sometimes called the Pekingese Beagle or Beagle Pekingese Cross, is a mix between the Beagle and the Pekingese. Since he is a crossbreed, it’s important to remember that he could inherit a number of traits from either of his purebred parents. Also, keep in mind that you are considering a designer dog, and with that comes a bit of controversy. Why the controversy, you wonder? One thing about purebred dogs is that breeders can pretty much guarantee what you’re going to get. With a crossbreed, things are a bit more difficult to pin down. A crossbreed, also known as a hybrid or designer dog, is the offspring of two purebred parents. The traits from one purebred parent usually differ drastically from the other. Things like temperament, physical appearance, and even health can be left up to chance. Yes, it is true that purebred dogs suffer more generational health problems as a result of overbreeding, but does that mean that a crossbred dog is healthier? Many who support crossbreeding think the practice may be a solution to the inheritable health issues purebreds face. Others disagree, with naysayers insisting that crossbred dogs can be just as susceptible to inheritable health issues as their purebred counterparts. To learn more about the pros and cons of crossbreeding, click here. If you are wondering what the difference is between a mutt and a crossbreed, you’re not alone. This is a fair question and also part of the debate. However, those who support crossbreeding point out that while mutts have a lineage of several different breeds in their bloodline, crossbreeds are the offspring of two specifically chosen purebred parents. For more information on mutts verses crossbreeds, visit us here. And now that we’ve covered the basics of the debate, let’s move on to the fun stuff, like learning more about the Peagle! Where Does the Peagle Come From? The origin of the Peagle is still a bit hazy, considering he is a first-generation crossbreed. However, if you want to know what makes him tick, you can look into the histories of his parents. The Pekingese, or Peke, is believed to be over 2,000 years old! So old, in fact, that original documentation on him is scarce! However, one Chinese myth tells of how the Buddha shrunk a lion, thus creating this tiny maned dog. While this story is a fun one, and while the Peke does have the face and mane of a lion, the truth behind his origin remains a mystery. However, experts believe he did hail from China and was bred to his miniature stature by Chinese emperors. So beloved was the Peke to the Chinese that stealing one could be punishable by death! Despite their popularity in China, the Peke breed remained unknown to westerners until the 1860s. British troops stumbled upon them during their invasion of Beijing in the midst of the Opium Wars. Five of the royal family’s dogs were looted, along with other goods, and given to Queen Victoria as gifts. Shortly thereafter, the Pekingese’s popularity skyrocketed, and by the 1890s, the breed had made its way to America. Shortly after being officially registered by the AKC in 1909, one lucky Pekingese drew media attention after being one of three dogs to survive the tragic sinking of the infamous Titanic. Today, this quirky breed sits at number 93 out of 194 on the AKC’s list of America’s most popular dog breeds. So what about the Beagle? Renowned for his keen hunting skills and signature bark, the Beagle’s history is a mysterious one. Just like his Peke counterpart, the Beagle is an ancient dog with rather vague origins that have been the cause of debate amongst historians and dog lovers alike. However, others claim the word Beagle actually comes from the French term “be’geule,” which is a phrase used to describe the howling Beagles are famous for. While we may never know the official origin of the Beagle and where his roots truly lie, one thing is for sure—the Beagle was and is very popular, especially amongst hunters! His primary role was as a foot hound, and he was used by hunters in England and North America who hunted on foot. Beagles were easy to keep up with and therefore excellent hunting dogs for the elderly who couldn’t ride horses, or the poor who couldn’t afford them. Despite their popularity, Beagles didn’t arrive in the US until after the Civil War, where their fame as fabulous hunting dogs continued to grow. Today, Beagles are still adored just as much for hunting as they are for family pets, ranking at number 5 on the AKC’s list of dog breeds! If I Get a Peagle Puppy, How Big Will He Get? 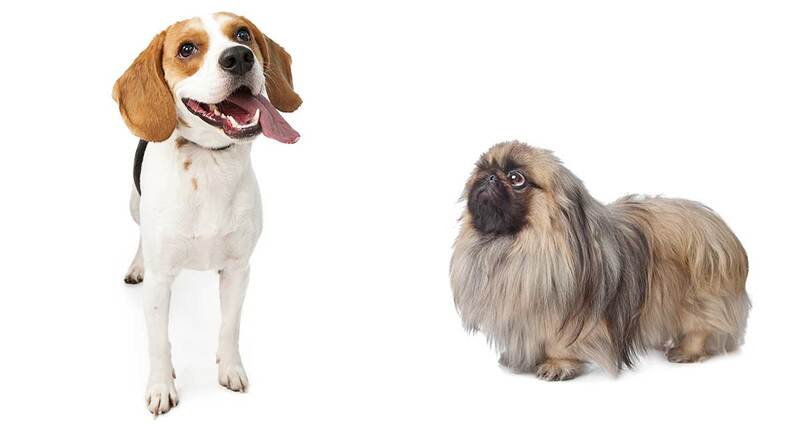 The Pekingese and Beagle are very different, so how can you predict the size of your Peagle? The best way to do this is to look at the size and weight of the parents. Then remember that the Peagle offspring could be the average of that or closer in size to one or the other. The Pekingese, for example, is very small, growing to be only 6 to 9 inches in height and weighing a mere 14 pounds! The Beagle is a bit larger, growing to be about 13 to 15 inches tall and weighing 20 to 30 pounds. Remember, your Peagle dog is a crossbreed and could be small like his Peke parent or a bit larger, like his Beagle parent. Or he could be somewhere in the middle. It all depends on which parent he takes after most. What will your Peagle look like? As we’ve gone over, the Peagle is a mixed breed, and there are a number of characteristics he could inherit from either of his purebred parents. Since your Peagle is a cross between the Peke and the Beagle, he could have any range of the coat variations and colors listed above. But does this rule apply to temperamental traits as well? The Peagle dog is a crossbreed, and as we’ve mentioned, this means that most of his traits are going to be left up to chance depending on which purebred parent he takes after most. The Pekingese and Beagle mix is likely to be a friendly dog, as both the Beagle and the Peke are known for their affectionate natures. But what else could the Peagle inherit from his purebred parents? Well, the Pekingese comes from a regal history, and he is a proud dog who, although tiny, has the heart (and mane) of a lion! The Peke is an opinionated dog as well, according to the AKC, and his compact size makes him adaptable in many different home types, whether they are magnificent palaces or tiny apartments! However, this is a vocal dog who enjoys using his bark. If you are looking for a watchdog, then the Peke is an excellent choice. A lapdog at heart, the Pekingese typically picks one person in the home as his favorite. While he is tolerant of kiddos, he does not enjoy rough play and can easily get injured due to his small size. The Beagle, on the other hand, is known for his playful nature and family-friendly persona! He is a great dog for kids and singles alike, though he requires lots of exercise and playtime in order to harness his natural energy. Remember, one of the Beagle’s most famous features is his bark, and just like the Peke, the Beagle isn’t shy about speaking up. You can expect your Peagle to be a bit chatty, but whether he will be excellent around kids or simply tolerant of them will be up to genetics as well as early socialization and training. With all dogs, we recommend early socialization and obedience training to ensure they are happy and well-rounded, and the Peagle is no exception. How Do I Groom and Otherwise Care for My Peagle? The Peagle’s coat could go either way depending on what he inherits from his purebred parents – and the Beagle and the Peke have very different coats, indeed! The Pekingese, famous for his lion’s mane, has very long hair that sheds seasonally and does require some maintenance. The AKC suggests brushing him at least twice a week, for at least one hour per session. He can be prone to mats, as his hair is rather long, so brushing and occasional baths should help to keep him tangle-free and should help control all that loose hair. The Beagle, on the other hand, has a shorter coat that gets thicker in the winter and sheds throughout the year but mostly in the spring months. Weekly brushing about two or three times a week should help keep that loose hair at bay. Luckily, Beagles don’t need many baths and will only need to be washed if they get particularly soiled. So the coat which your Peagle puppy inherits will determine the amount of grooming, brushing, and bathing he needs. However, regardless of his coat, the Peagle will require his nails trimmed regularly to avoid painful cracks and splits. And he will need his ears cleaned to keep moisture and infection at bay. Are There Any Special Exercise and Training Requirements for a Peagle? The Peagle is a cross between two pretty intelligent pups. However, both the Peke and the Beagle have different personalities that could determine how easy training will be and how extensive the exercise requirements are. If your Peagle inherits his Peke parent’s disposition, you can expect him to be rather calm. However, the Pekingese does enjoy play. A romp through the house or in the backyard should be all it takes to meet his exercise requirements for the day. You should note that because of his flattened face, the Pekingese is prone to brachycephalic obstructive airway syndrome (BOAS), which is a respiratory issue that affects the breathing. Due to this syndrome, the Peke may have some intolerances to exercise and heat. BOAS can be a serious syndrome that must be considered when thinking about getting a Peke cross of any kind, but we will cover more about BOAS further down. For now, let’s talk about training. 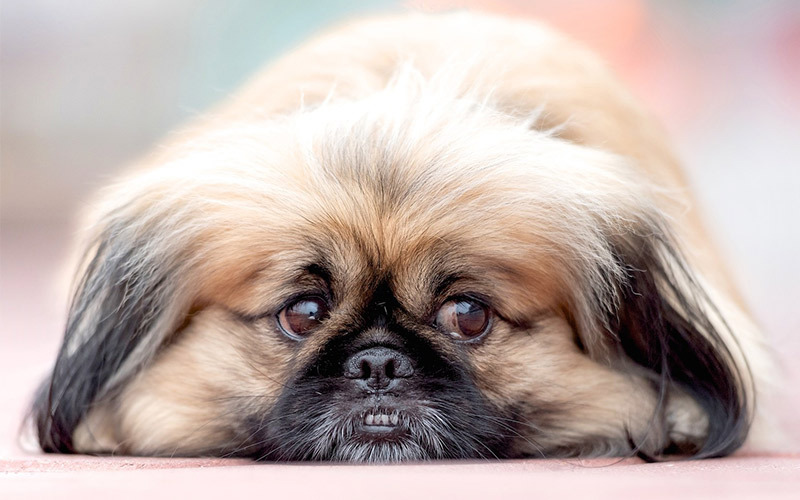 As far as training goes, the purebred Pekingese has a tendency to be stubborn. If your Peagle inherits this trait, remind yourself to be patient and only use positive reinforcement. Treats are a great way to entice your Peagle to follow your commands! If your Peagle inherits more of his Beagle parent’s disposition, his exercise requirements are going to be a bit more demanding. 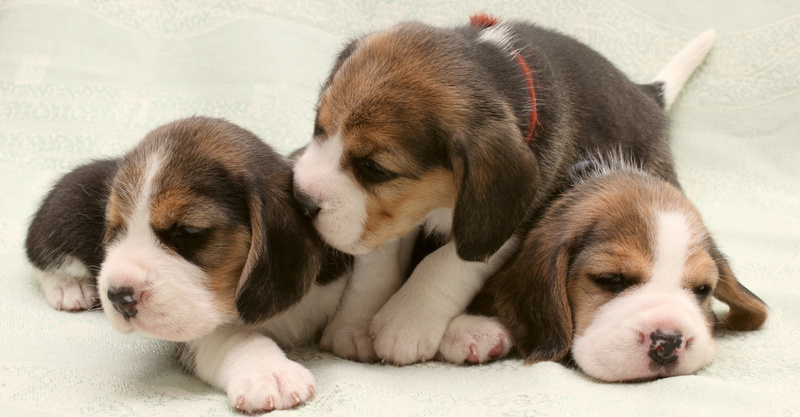 Since Beagles come from a history of hunting and outdoor play, your Peagle crossbreed may require at least an hour or more of playtime and exercise each day. Training a Beagle personality may be easier than training a Peke, as they are more agreeable and willing to learn. However, Beagles do not respond well to harsh words and punishments. In fact, most dogs don’t. Always use positive reinforcement, regardless of how responsive your Peagle is to training sessions. Remember, with consistency, patience, and a loving hand, you’ll get him where you want him to be! And as previously mentioned, early socialization and obedience training will also help to ensure your Peagle is happy and well rounded. Since the Peagle is a first-generation crossbreed, his lifespan and any health issues he may encounter will mostly depend on what types of possible ailments he could inherit from his Beagle and Peke parents. The Pekingese does have some health issues to be aware of that could be passed down to their Peagle offspring. With a lifespan of 12 to 14 years, the Peke is most predisposed to ear infections, heart disease, hernias, bloat, and autoimmune hemolytic anemia. And as previously mentioned, the Peke is also predisposed to BOAS. BOAS is a condition that affects all dogs with brachycephaly, which is the flattened face depicted by the shortened nose and jaw. BOAS can cause respiratory difficulty, with symptoms including loud breathing, snoring, difficulty exercising, intolerance of heat, gagging, vomiting, and regurgitation. For a full article covering brachycephaly, visit us here. Keep in mind that this syndrome is likely to affect most Peke dogs in some form or another and can cause overall discomfort, amongst other things. While treatments are available, specifics on price and overall management of BOAS can vary. Let’s move on to the Beagle. The Beagle has a lifespan of 10 to 15 years and can be prone to cherry eye, glaucoma, ear infection, hypothyroidism, epilepsy, intervertebral disk disease, and pulmonic stenosis. We like to recommend early health screening whenever considering adding a new dog to your household. Early health screening could help you prepare for, or even avoid, certain inheritable health conditions in your Peagle puppy. Will the Peagle Fit into My Home and Lifestyle? The Peagle sounds like he would make a wonderful pet for the right family, but what about yours? The Peagle dog is likely going to be friendly, outgoing, and affectionate, but he could be vocal and may not do well with younger, rougher children. However, he is adaptable to most living conditions. He could require extensive grooming and at least an hour of exercise a day. He may require a bit of patience when training as well. Keep in mind that while many inheritable health issues are going to be left up to chance, if your Peagle inherits his Peke parent’s flattened face there is a high chance he will suffer from BOAS. Be sure you are prepared financially and emotionally for the management and treatment of this possible respiratory health defect. If you have the time and patience to train your Peagle, if you’re willing and able to give him the exercise he needs, if you have a family with older, more respectful children, and if you don’t mind a vocal watchdog, then the Peagle just might be the perfect fit for you! I Think the Peagle is Right for Me! How Do I Find a Peagle Puppy? If you’ve got a Peagle-shaped hole in your heart, don’t worry. We’ve got a few tips on how you can go about finding Peagle puppies. If you’ve been looking into adopting Pekingese Beagle mix puppies from a shelter, keep in mind that you may have to exercise some patience. The chances of a Peagle being in a shelter at the time you are looking could be hit or miss. However, one of the benefits of rescuing a Peagle, aside from the fact you are rescuing a Peagle, is the price! Adoption from a shelter is much less expensive than going through a breeder. However, there are still adoption fees, which are typically $50–$100. Also, shelters usually cover the initial vet fees. If you have, instead, been looking at Beagle Pekingese puppies through a breeder, keep in mind that Peagle breeders are going to run you anywhere from $500 to even $1000, depending on the Peagle’s purebred parents. If the parent dogs are show quality, expect to pay a bit more. Also, keep in mind that reputable breeders should be able to provide certificates proving their puppies have been health screened and are healthy and ready to go home with you. If you are still not sure where to turn to find your Peagle puppy, you can always check out local AKC clubs. Networking at events such as dog shows can help to point you in the right direction. Let us know in the comments below what you love about this crossbreed! Michelle Trappler, VMD, Kenneth W. Moore, DVM, DACVS, Canine Brachycephalic Airway Syndrome: Pathophysiology, Diagnosis, and Nonsurgical Management. Stacy D. Meola, DVM, MS, DACVECC, Brachycephalic Airway Syndrome, Topics in Companion Animal Medicine. Borbala Turcsan, Adam Miklosi, Eniko Kubinyi, Owner Perceived Differences Between Mixed-Breed and Purebred Dogs. Tiffani J Howell, Tammie King, Pauleen C Bennett, Puppy Parties and Beyond: the role of early age socialization practices on adult dog behavior, Volume 6, pages 143-153. Nathan B Sutter and Elaine A Ostrander, Dog Star Rising: The Canine Genetic System, Nature Reviews Genetics, Volume 5, pages 900-910.